During the last twenty-six years, Chip Kidd has designed over 1,000 iconic, award-winning book covers that have revolutionized and inspired jacket design. He is the author of The Cheese Monkeys, The Learners, the graphic novel Batman: Death by Design, GO: A Kidd’s Guide to Graphic Design and many other books about comics and design. Hailed by USA Today as “the closest thing to a rock star” in graphic design, you can find him online at Chipkidd.com. Failing Better Chip Kidd will recount examples from his career of over a quarter-century where he failed utterly and used those circumstances as an opportunity to do something better than he did in the first place. After the usual process of drinking and crying, of course. For more information, visit innovatevirginia.com. Kidd has a new book releasing on October 8: Go: A Kidd's Guide to Graphic Design. In this introduction to graphic design, an award-winning graphic designer details the ways in which a designer communicates his or her ideas to the world. The book is written and designed just for those curious kids, not to mention their savvy parents, who want to learn the secret of how to make things dynamic and interesting. Chip Kidd promotes Bat-Manga! The Secret History of Batman in Japan. Neil Gaiman discusses Sandman. ; Chip Kidd discusses Sandman. Chip Kidd promotes Bat- Manga! The Secret History of Batman in Japan. Chip Kidd reads from The Learners. Chip Kidd's book Just My Type was available from LibraryThing Early Reviewers. 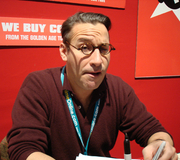 Chip Kidd is currently considered a "single author." If one or more works are by a distinct, homonymous authors, go ahead and split the author. Chip Kidd is composed of 3 names. You can examine and separate out names.